Constructed of 4 gauge wire and 14 gauge flared channels. 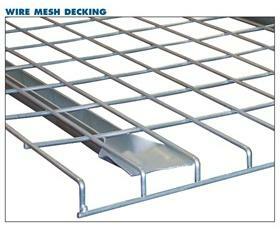 Featuring a durable powder coated finish and 2-1/2" x 4-1/2" wire spacing. Each level of decking consists of two or more smaller panels. Silver in color. FOB Shipping Point.